Spent a fabulous Saturday cooking and crafting yesterday with two of my favorites. When we get together, we’re always looking for something to do in the kitchen. And since my oven is working again (!) we decided we had to bake something. That’s when the term “monkey bread” came up. I have a confession to make. 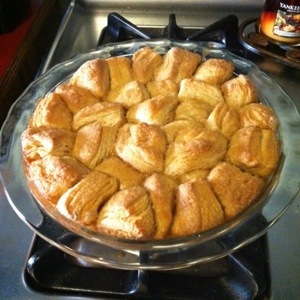 I’ve never made Monkey Bread before. I feel like it’s a New England thing or New Hampshire thing or something, but all of my friends around here know what it is and know how to make it. 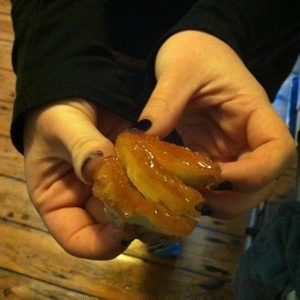 I did not grow up eating Monkey Bread, so it’s been one of those things that I’ve always wondered about. What is it? Basically it’s cinnamon and sugar doughy baked goodness. So not good for you. That, however, did not stop us. Preheat oven to 400 degrees F. Lightly grease or butter a glass baking dish. In a large bowl, mix granulated sugar and cinnamon. Separate biscuits and cut into quarters. Place in the cinnamon-sugar bowl. Mix until biscuits are completely covered. Place into baking dish. In a small bowl, mix brown sugar and melted butter. Pour over biscuits. Bake for 20-25 minutes, or until golden brown and no longer doughy in the center. Let cool for 10 minutes. Pull apart and serve.